We’ve all lost things of value to us. Class ring overboard on a fishing trip. Fifty bucks in a poker game. Air-cleaner wingnut down the carburetor. Those hardly compare to the punchbowl Henry Ford won in the race that essentially gave birth to the Ford Motor Company, which the Ford family lost more than 65 years ago. Now, once again, the company has put the call out for the prized prize. As Automotive News reported, the recent re-emergence of the Bullitt Mustang–once considered the holy grail of missing Ford automobiles–has renewed Edsel Ford II’s push to locate the unmarked cut-glass punchbowl. “In a way, the trophy means a great deal,” he said. Henry Ford wasn’t exactly an unknown quantity in 1901 when he entered the exhibition race at the Detroit Driving Club; rather, he was known as a failed carmaker. 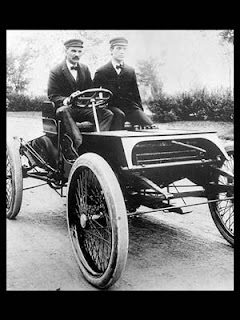 A couple years prior, after testing out his Quadricycle, he had attracted some investors (among them Detroit’s mayor) and, under the name Detroit Automobile Company, built a dozen or two vehicles. But by January of 1901, the company collapsed. Ford, then 38, moved back in with his parents and concocted a scheme to return to the automobile business that was full of wishful thinking: He’d build a racecar! And enter it in a race the Detroit Driving Club would host in October! And his success there would bring all sorts of investors knocking on his door! The improbability of the scheme became readily apparent the day of the race. While most of the competition didn’t show or didn’t make it to the starting line, Alexander Winton did. Winton, who had been successfully producing automobiles since 1897, also believed in racing his cars. 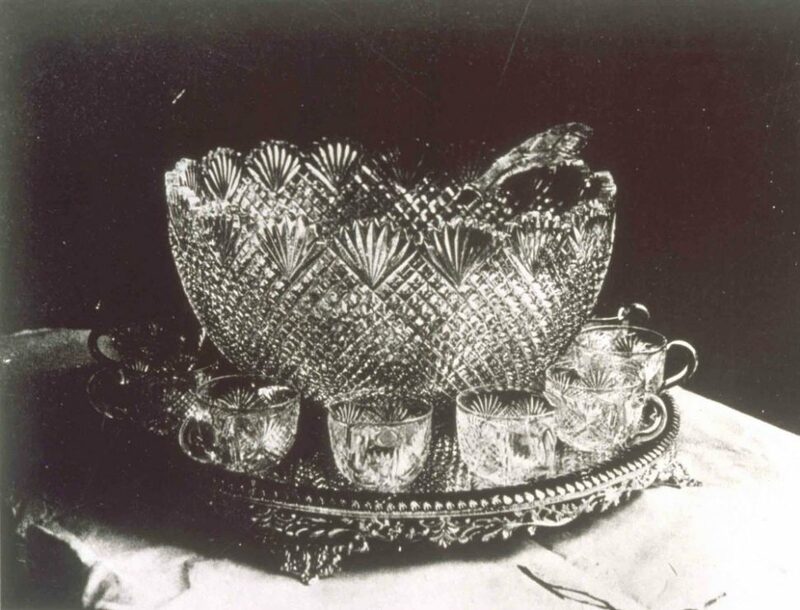 The organizers of the race were Winton dealers and, anticipating that Winton would handily win the $1,000 race, had either Winton or his publicity manager choose the trophy to be granted to the winner: a cut-glass punchbowl set. Reportedly, it would perfectly capture the light in a bay window of his Cleveland home. Ford arrived atop a 26-hp 538-cu.in. twin-cylinder-powered contraption he optimistically named the Sweepstakes. And from the start of the race, it appeared all would go as anticipated. Winton took the lead and held it. Until the seventh lap, that is, when Winton’s heavier car began to misfire, allowing Ford the opportunity to pass and take the win three laps later. 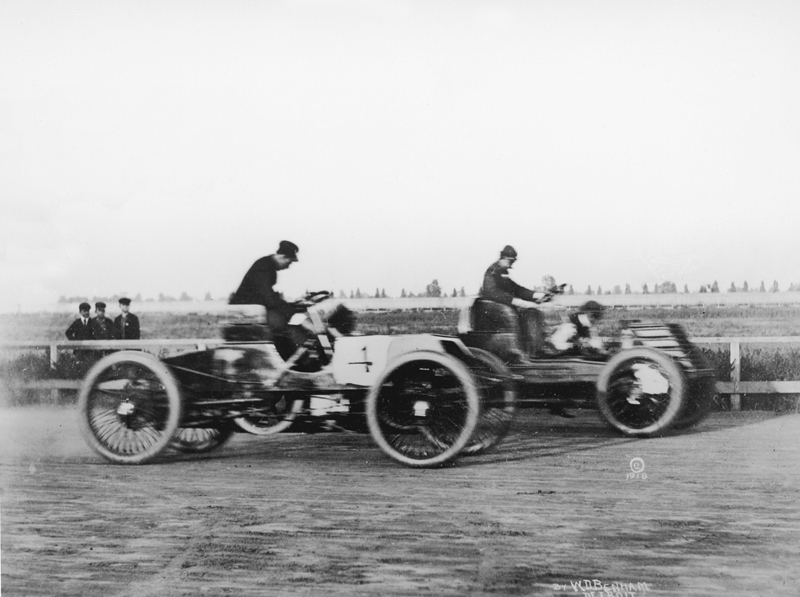 Henry Ford (4) about to pass Alexander Winton in the famous 1901 race. Photo courtesy Smithsonian. While lore has it (and Automotive News repeated) that the $1,000 winnings (as much as $828,000 in today’s dollars, depending on your measure) helped Ford start Ford Motor Company, the path from race to Model A isn’t nearly that direct. Rather, with some of the same backers, Ford reorganized the Detroit Automobile Company into the Henry Ford Company a month later. Immediately, Ford and his backers clashed over whether race cars were a worthy pursuit: Ford, fresh off his first (and only) race win, wanted to continue developing competition vehicles while his backers, interested in a return on their investments, pushed to jump right back into production. Ford left the company not long after with $900 and a promise that his backers wouldn’t use his name. William Murphy, one of Ford’s backers, turned to Henry Leland, and, in 1902, proceeded to reorganize the Henry Ford Company into the Cadillac Automobile Company. Ford, for his part, built a couple more race cars, the Arrow and the 999, and got coal baron Alexander Young Malcolmson to back his next venture, Ford Motor Company. The punchbowl, in the meantime, remained with Henry and Clara Ford through Henry’s death in 1947 and Clara’s death in 1950. Yet, for whatever importance Ford historians now attach to the punchbowl, it went to auction through Parke-Bernet Galleries in New York a year later along with many more of the couple’s possessions. According to research done in 2011, when The Henry Ford last made its big push to find it, the punchbowl sold for $70 (about $1,000 in today’s dollars) to The Garden Shop, a New York business that has long since closed. Researchers haven’t turned up any trace of the punchbowl, and Edsel Ford II told Automotive News that he fears it may be gone forever. However, on the off chance it still exists, he–and many others, including The Henry Ford’s Curator of Transportation, Matt Anderson, who described the punchbowl as a “holy grail artifact”–hopes it does and that it makes its way back to Dearborn. They’ll probably have to pay a little more than $1,000 for it, though. 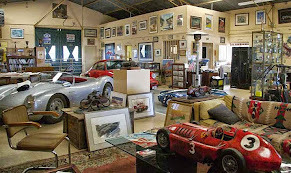 We here at l'art et l'automobile obviously have a keen interest in Lost or Hidden Treasures, or more importantly finding and preserving them. In Fact, we make a point of doing so at every occasion. And to that end we have gathered a collection of trophies and ford artifacts and presented the collection to you. Come tour the Gallery Here, and perhaps you can take home a piece that becomes a priceless family heirloom to you.